This could be viewed as a breakthrough moment for our district as it was highly publicized and our math department opened their doors to other schools wanting to learn from them. The school innovation flywheel began to spiral. Since the award in 2011, we have had many “break throughs” in education innovation including Hybrid Learning, ePortfolios for all students grades 7-12, Our first annual Innovation Fair, 1:1 iPad Pilots in Grade 7 as well a few 1:1 carts (K, 2, and FACS) and the addition of the Digital Learning Coach this year a “flipped PD” edtech coaching model. 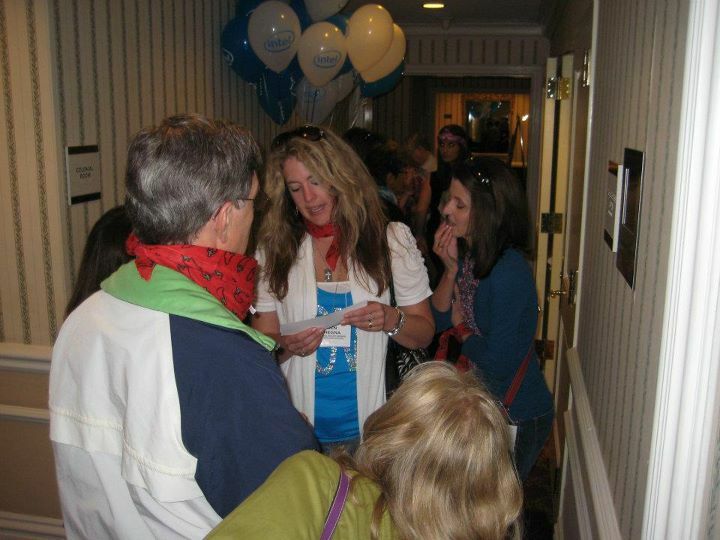 I was asked – What was it that led your district to this exciting journey? Hmmm. I really couldnt pinpoint it. We have always had moments here in Byron that have been considered innovative. We went completely wireless in the district and gave every teacher a laptop in 2002. In 2005 we created a 3 year tech plan that included SMART boards in every classroom. We built a new High School in 2006. Data Coaches came in 2007 and in 2008 we began our PLC journey as well as our Online Learning committee. In 2009 we migrated to Infinite Campus and in 2010 we adopted Google Apps for Education (my personal favorite prior to winning Intel SODA). We have had many schools come and visit us in the last year. When they do, we often hear comments like – I wish we could “bottle this up” (our culture) and bring it back to our districts. And then we hear about the roadblocks and challenges face. Our administrators are not on board. Our Tech director is a Network Nazi. Our Teacher contracts/climate would never support these ideas. I believe that in the problems other describe – lies the answer to the culture of innovation in our district. BPS did not magically arrive to this wonderful place overnight. I believe the partnership between our board/administrators, tech, teachers, and community is what has helped our success in edtech innovation. Its ok to have new ideas and challenge the status quo. Our leaders remove barriers that stifle innovation (THIS IS BIG). Most of the most innovative ideas we have had – have not been a top down initiative. Teachers are allowed to take risks and lets face it – with risk comes failures. And its ok to fail – as long as you learn from it. 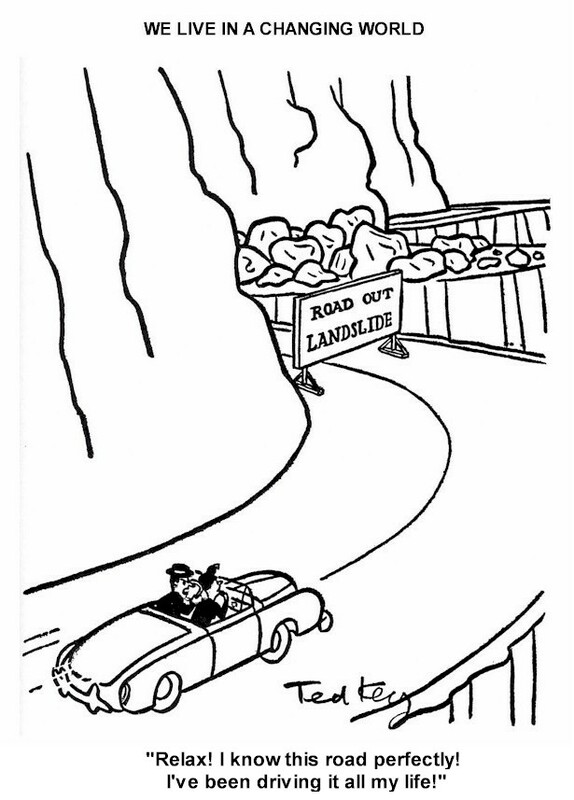 Sometimes great ideas don’t work perfectly the first time around…. As a tech director I find that taking time to listen, reflect, and help resolve the issues… will improve outcomes for my teachers. It is also important to listen to ideas around you. (I use Twitter for my outside of Byron idea catcher) Good ideas deserve your attention. Whether they are online, in a school district down the road, or ESPECIALLY in a classroom down the hall – sometime an idea just needs to be shared or encouraged to make it happen. Teachers that know they have their tech director and administration in their corner – are going to feel much more confident and empowered. And these empowered teachers have an amazing effect on students and their learning. I am not sure if this is the perfect recipe for school innovation. But it certainly has helped move our district forward. It is the last day of August just before the nice 3 day labor day weekend. I have a few minutes before tasks and I thought I would be a good time to reflect on my summer! (with the district) My edtech summer can basically be summed up in 3 words: Infrastructure, Devices, and Development. This was certainly a year for infrastructure upgrades! In preparation and planning for 1:1 and PLD it was apparent we needed the infrastructure to support these devices. Internet Bandwidth – Upgraded from 45MB to 100MB pipe to the Internet. Our plans are that we may have to double every year to support online learning in our classrooms. Access Points. We have nearly doubled our coverage in our schools and have upgraded many of our AP’s to the Cisco Aironet 3600i AP’s. More throughput and coverage for more devices at longer distances. Also will be upgradable when the new AC standard comes out! Apple Mobile Device Manager Server – With a 1:1 7th grade program we needed to be able to control and monitor the devices remotely. Right now, I think the Apple’s server will do – but I am always looking for other alternatives. I am already planning for “what happens next year” and adding additional iPad 1:1 grade levels. More POE switches – We needed to add Power Over Ethernet switches (1GB) in several of our buildings to support the additional APs. Wireless Lan Controller #2 – We needed another controller (50 client) to support our additional AP’s. Moodle Server – Our district made the jump to the latest version of Moodle. 2.3 from 1.9. The interface is different -but also much improved. We also can easily integrate cloud storage from Google Apps, Dropbox, Box.net – which will be critical for the classroom workflow when using iPads or other PLDs. PRI Circuits. We have moved our phone system from many many spendy analog lines to 2 PRI circuits saving us thousands of dollars each year, including no more long distance bills. Asset Management – We now have the ability to track our inventory through our helpdesk system. We started the year tracking iPads but plan on putting every device in the system and associate them with users/classrooms. No more spreadsheets – YEAH! Even though this felt like a year for iPad deployment, we also had quite a few desktop and laptops we deployed. We still have some needs for our curricular programs to have desktops. And as of now – we also have to ensure we have spots available for testing! However, word out on the street is that our State testing program may be creating an APP for the iPad. If/When that happens, I do believe the idea of a “computer lab” will be antiquated and current replacement funding will be studies to support more 1:1. We can not forget that people need to not only need to know how to RUN the devices we have given them – but also how to effectively integrate them into their classrooms. iPad Training for 1:1 teachers – We have several 1:1 pilots happening in our district. 1 cart in Kindergarten classroom, 1 cart in a 2nd grade classroom, 1 cart in a high school FACS classroom, and a 1:1 in 7th grade – We had Jenn Nelson of Eden Prairie come down 3 days to help faciliate training/discussions in using the iPads in a 1:1 environment. I think the toughest scenario will be utilizing the iPads in a multi-user environment (FACS) They simply are not made to be multi-user devices. At any rate – we needed to prepare our staff for these devices. eLearning Certification – I have developed a 6 week certification program for district teachers who want to teach online or develop hybrid courses for our district. We now have a board approved process in which teachers must follow before being allowed to teach hybrid. It starts with the certification. This course is not just about how to do Moodle (even though they will learn how to do Moodle) – it is more about how to facilitate online learning – Developing quality online resources, activities, and assessments according to course objectives while building collaboration among students is the main focus of this course. They have a peer review sample ready to go upon completing the course. Bears Professional Growth Academy – Another great academy took place this year! 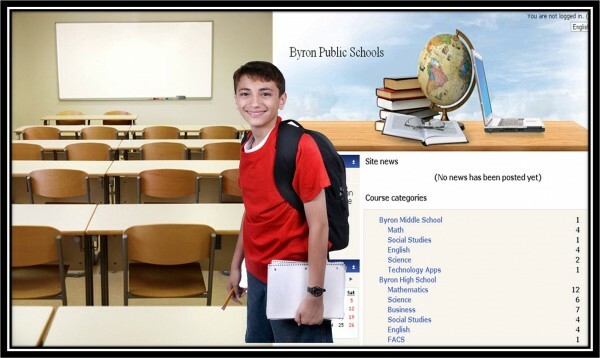 Attendance is between 60- 70% of Byron Teachers that VOLUNTARILY attend. Right now we have accumulated over 1300 hours of PD for our staff as well as others from other districts Check out our PGA archive! Digital Learning Coaches – Of all the projects we have accomplished this year – I would have to say I am MOST excited about this one. We have always done a very good job preparing our teachers for technology, but not a good job helping with the implementation. This is our answer to what others call “Tech Integrationalists”. Here is the video “all call” I sent to my staff and we were fortunate to have quite a response from district teachers! We plan on utilizing the FlippedPD idea and were fortunate to have Kristin Daniels and Wayne Feller (StillWater Public Schools) to help kick off the coach training! I have some incredibly eager teachers who are very engaged on helping EVERY classroom (PK-12) effectively integrate technology to support teaching and learning! We started the school year with a visit to every school share the processin developing our own teacher Digital Learning Network. It was AWESOME and one of my PROUDEST moments for the district! I sincerely hope all of the summer of installs and planning pay off – and this school year is one of my best….EVER~! Today we updated our sandbox Moodle server so that I could begin testing (and training) on the new system. We will be officially transitioning our production Moodle to 2.3 this summer. This couldn’t come at a better time. As my previous post indicated, we will be piloting iPads in grade 7 and several elementary classrooms. One of the very cool things about Moodle 2.2+ is that it integrates EASILY with Dropbox. This will assist teachers as they develop a “paperless” classroom with the iPad and Students will now be able to submit iPad created assignments to Moodle. We have discussed sharing Dropbox folders and creating write only Dropbox folders. 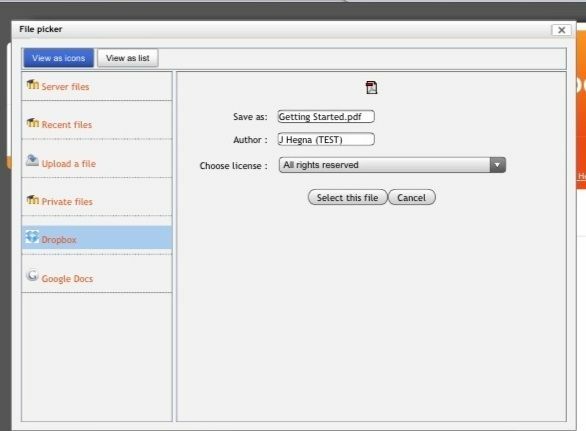 Why is this Moodle workflow option worth considering? The answer is easy… Moodle helps with file organization of student submitted work. It also allows for a more organized way of providing private feedback to students. There is also the integration of Google Docs – however it is a little “hokey”. (Yet works – but you do not have access to your folders?) I am hopeful – HOPEFUL – that the iOS Google Drive is available by the start of school. (fingers crossed – Julyish!) I am thinking Drive may eliminate students having to create a dropbox account. Students will already have Drive accounts via our districts Google Apps for Education integration. I am also hoping with Google Drive -that the Google Docs works better. It is a bummer that docs is very basic on the iPad and does not allow for real-time collaboration. Oh – and Google Presentation isnt even an option! Below is a screenshot from the iPad in Moodle. Students click Dropbox and easily navigate to the file (PDF, Jpg, ePub, and even Doc, PPT, XLS). Save it – and submit. It is timestamped and ready to be graded! Teachers can access via computer or iPad and then provide feedback about the assignment if appropriate. Students can easily see what they have submitted, and what they need to complete because of the timestamp. I think its a good option and we are going to GO FOR IT! Here we go….1:1 with iPads! Its official, after the board meeting last night we were approved to pilot 1:1 iPads in our classrooms next year. We have selected grade 7 (will go home with students) as well as several elementary classrooms (will stay in classroom on carts). We are going to do some major infrastructure upgrades this summer to support our district moving in this direction. We are upgrading our Internet bandwidth from 40mb to 100mb (with thoughts of doubling every year). We will be doubling our access points district wide. We also will be upgrading our connections between buildings from 1 GB to 10 GB. We most likely will also install a new lion server to support and manage these devices as well as the apple/iPhone configurator. I won’t lie – the management of the devices is so new and different it can be a little overwhelming… but I refuse to be the road block in moving forward in this project! Training for our teachers in this project begins this Thursday! One thing about the 7th grade team, is that they have all been “online certified” and have already digitized their curriculum – mostly via Moodle and Google Apps. Last night our teachers demonstrated some great apps as well as the evolution of textbooks over the the apple TV. Every classroom will have this device (Apple TV) installed and will work nicely with their current multimedia systems. I will be honest, if this existed several years ago – I am not certain we would have invested in the interactive white boards like we have. While we have been planning planning and planning for this project (for months now) I thankful for districts, like Minnetonka, that have put ALL their information out on the web. This has really been helpful when developing our own plans including expectations and policy adjustments. 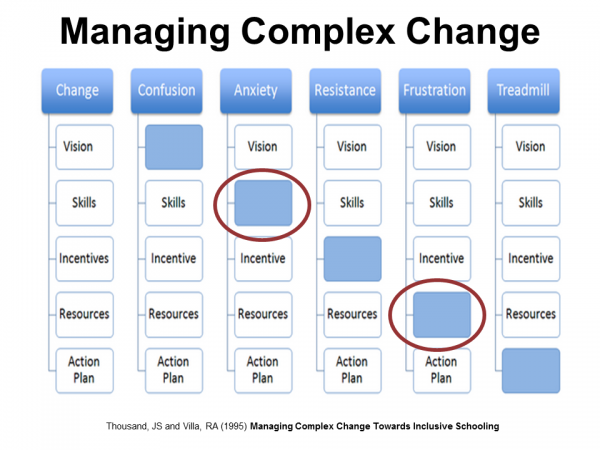 No one ever wants to reinvent the wheel do they? I thought I would share the goals and measures of this project. I am proud to say this has been a collaborative effort and our teachers have really stepped up to the plate in helping us with the planning. It is their leadership that will drive the current and future success of this program! GSH % attendance – decrease? WOOT WOOT! Tonight, I left my district Staff Development committee meeting totally thrilled! My full summer academy budget from several years ago (previously cut in half), has been reinstated. So, the brainstorming begins…. Here are some possibilities that I am tooling in my head. Would love to hear feedback and other ideas! 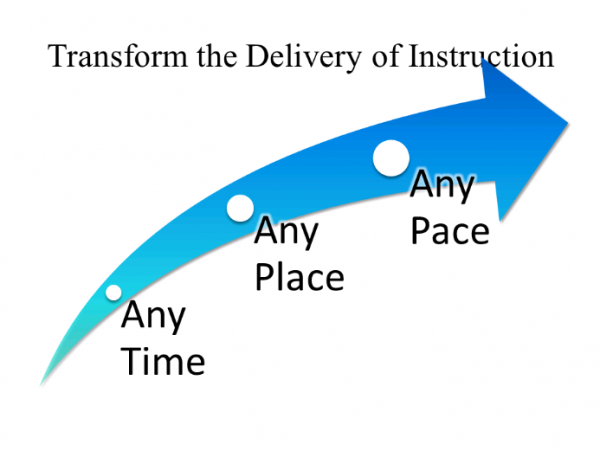 eLearning – Flipped, hybrids, fully online – Whether it is learning how to create 24/7 learning objects to developing fully online courses, we need to break “school” learning from our classroom’s traditional 4 walls. We have received some great recognition of our Flipped Math/No textbooks curriculum…It makes sense that we continue to expand it to other classrooms or schools. Moblile Learning – iPods, IPads, BYOD – we have them all and we need a better understanding on how to integrate them into our classrooms. According to a recent (HS) survey, 80% of our students have a device, yet only 22% of our classrooms allow them on a regular basis. We need to understand their potential. Of course, increasing the amount of online content will help – but I feel we need to showcase the possibilities of using these devices to create learning artifacts vs. just passively watching videos or surfing the web. The biggest challenge, finding/understanding apps/sites that are endpoint independent. They are out there – we just need to put them in our “bag o tricks”. Possibly find a MN expert to visit? IWB – I know, I know, not everyone is on the IWB bandwagon, but we have already spent the $ and have them installed in our classrooms. We need to improve our staffs use of these devices. Truly finding ways to make them Interactive (with students vs. the Sage on the Stage) is worth looking into. Also looking at specialized training according to subject area. Special Ed, Early Childhood, elementary math, reading, science – as well as effectively incorporating them at the MS and HS. Other possibilities… Utilizing Formative Assessments, Improving Reading, Math, Science instruction, Differentiation, RTI, PLCs. Not all of our academy sessions solely focused on technology – so these are some opportunities. I would LOVE to hear of MN experts who I could possibly connect with on these topics to have them come for a visit! Below is the data I collect every year after our academy. Thought it was appropriate to share. I really would like to see the Teacher Lesson/PLPs increased. Maybe the extra $ will help support that goal. I also want to expand online learning opportunities – Anytime, anywhere learning is very appealing – especially with busy summer schedules. Here are the offerings from last year goo.gl/LtPxB. Bears Professional Growth Academy 2012 will be August 7-9. Well at least the f2f opportunities. Looking forward to another great summer of learning! Its official, tonight our school board approved a pilot in which several of our high school teachers will be developing and implementing Hybrid courses. Whats more exciting, is that we will be starting as early as this quarter! Last summer, my principal and I attended Claiming your digital space:Developing an Online Program for Your District. I have to say, after leaving that day, it was like I had an digital epiphany. We have been dabbling in online learning for several years and have some great things going. We have teachers that have been certified (through a 5-6 week online course) to provide fully online courses. (so, we dont lose our students to other online programs) Our math department developed their own Moodle curriclum and was implementing Flipped classroom techniques and getting great recognition and gains in academic achievement! Seeing the writing on the wall, a couple of our teachers decided to begin developing content early this school year. Imagine the excitement I felt when I coordinated the first official meeting last week (to address the registration guide deadlines and possibly needing Hybrid language) and the teachers were ready to PILOT now, this quarter. And tonight, only 4 days later, we are getting board approval to move forward! We will still focus on course development 2nd semester, but to have some pilots started this quarter, to learn from, is going to be very beneficial! The statistics are clear. Online/hybrid learning is certainly on the rise. I am excited to say, our plan is coming together and I do believe we will claim our space when it comes to online learning! Stay tuned! Today I was fortunate to have my very first Google+ Hangout experience with brilliant, passionate and inspirational tech integrationalists from Stillwater and Edina Public Schools. It was fun to “hang out” with Kristin Daniels (@kadaniels), Wayne Feller (@fellbop), Heather Wells (@technovinci), and Michael Walker (@micwalker) and discuss our districts implementation of flipped classrooms. First impressions of G+ Hangout – is it is fun, easy to use. The quality was fairly good – even though there were a couple of hiccups where the video would freeze or we would temporarily lose audio. For the most part – there is a tremendous amount of potential with hangout and I honestly need to give this technology further consideration. I wonder where this leaves skype? It was somewhat ironic our paths crossed. Just this week in the Pioneer Press – Stillwater and Byron were both mentioned as using the Flipped or Reverse classroom techniques in their classrooms. While there has been quite a bit of buzz about this approach and the benefits for student learning, it was a tweet by Kristin Daniels that really sparked my interest, “…we are starting “flipped pd” where we work closely with teachers on personalized projects..” Flipped PD – makes so much sense to me – why on earth did I not think of it? If you think of a traditional f2f professional development – About a third of your participants are high flyers – they are either 3 steps ahead of you OR are bored to death, waiting for the other participants to catch up. You have the middle third, who are following along, engaged, and hopefully learning. Then you have the bottom third, that are lost or confused and taking more of your time as a facilitator to catch them up – then you have to work with the rest of the class. Sound familiar? A couple of things that Stillwater is doing with Flipped PD really resonated with me! First of all, when teachers select their PD offerings, they are shown finished best practice samples of projects that have been developed by other teachers. Not only does this engage potential participants, but it also is a great way to share (reward?) the work of that others have accomplished for the district. 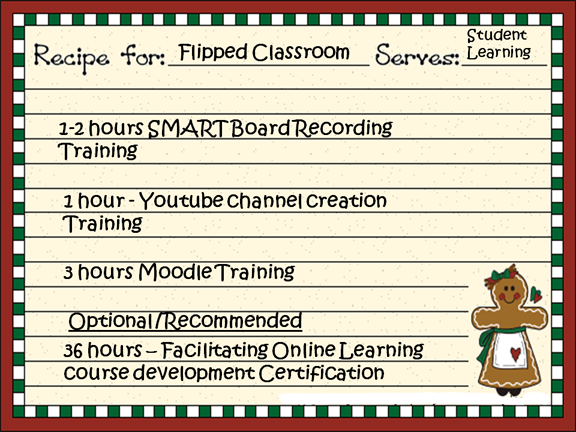 Included in the offering is a type of recipe card, or plan of what educators need in order to accomplish the project. The training videos and materials are hosted within Moodle, and are available to teachers when they are ready to learn. Face to face sessions are organized in small groups and teachers are able to ask further questions and get support. Staff also develop ILPs – individual learning plans (via Google Docs templates) that is a running reflective record of their learning. If you would like learn more about this ideas – the Stillwater staff are blogging every day about their journey! Definitely something I will be watching! Professionally, I don’t know that I have had a prouder moment. 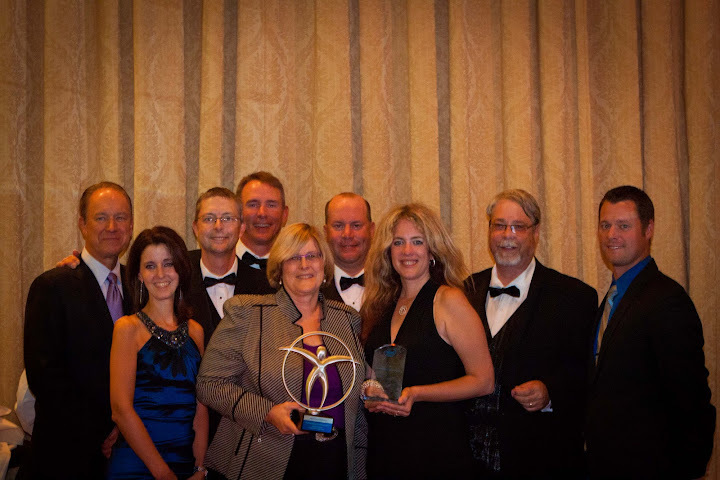 Last Tuesday (9/20/11), in Washington DC, Byron High School educators and administrators received the National School of Distinction Award for its innovative math program from Intel. I was fortunate to be selected to go along. 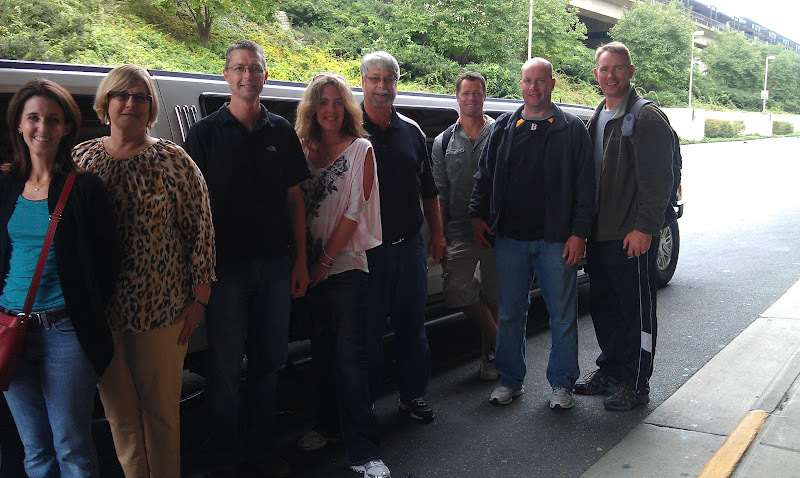 From the get go, we were treated like royalty. We stayed at the luxurious Mayflower Hotel, right in the heart of DC and within walking distance of all of the attractions including the White House, Lincoln Monument, Washington Monument, WWII memorial, Korean War Memorial, and the Vietnam Memorial… I felt I was fortunate to see these sites, as this was my first time visit to Washington. One little known memorial was the Albert Einstein monument. It is tucked away and almost hidden by over grown trees and shrubs. It was a must stop “photo shoot” for our math teachers – after all Einstein is the most famous mathematician of all time! 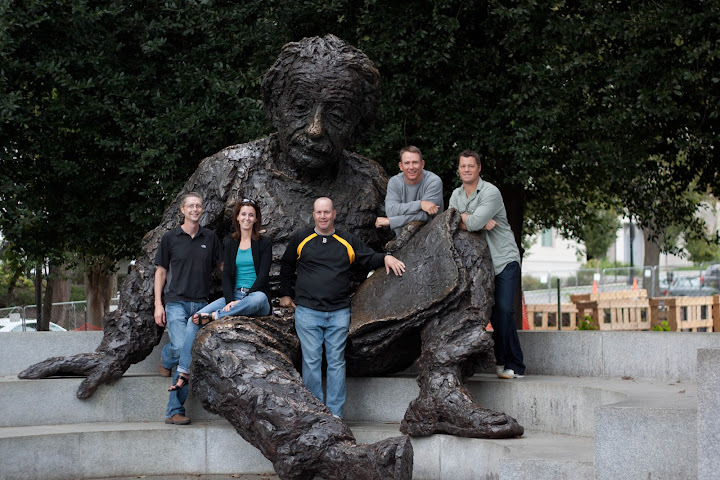 Math teachers stop for a pose with Einstein! That afternoon, Intel organized a DC scavenger hunt with the help of Code Red Caper. Our school team was divided and paired with other school finalists! This was a great way to meet the other schools and learn more about them more… Not to mention..have FUN! We met some great people and took home some great ideas from this activity. DC Scavenger hunt - We were the red hot chili peppers! On Tuesday, we spent the day at the capital! Intel organized congressional visits for all of the schools. We were also accompanied by an Intel Rep. (Rick Rocked!) 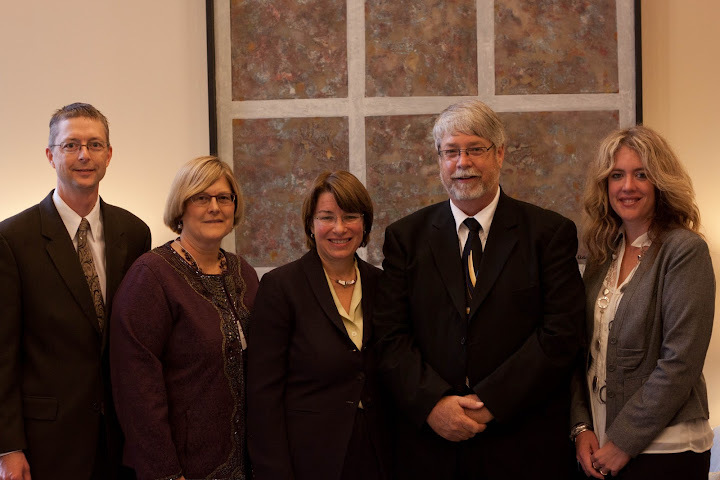 While some schools never met a single congressperson from their state, we were fortunate that all of ours (Klobachar, Franken, and Walz) took time to meet with us, hear our story as well as share/listen to educational ideas! With all of the schools present, finalists (all 18 schools) took turns and went up to receive their award. Now, it was time for for the final round. We anxiously waited for Top Math HS finalist. I quickly grabbed my Flip video camera and decided to record the moment the award was announced. Well, we WON! This video not only shows our excitement but you can HEAR the excitement as well! Byron High School team and our trophies! On Wednesday, we learned about our prize package. What was so impressive was while we were learning about the hardware and software, the package also included quite a bit of professional development and tools that can be implemented DISTRICT WIDE, which essentially will improve instruction in all of our schools preK-12! It was one of the most exciting moments in my career to win the Intel School of Distinction award and I am very thankful I was there to participate and learn from some very innovative schools – top in the nation. I want to mention, this award is open to all K-12 schools who demonstrate excellence in math and science education through innovative teaching and learning environments. It would be equally exciting for the district to see our Middle or Elementary schools apply/receive this award. The event will FOREVER be in my memory bank and I would love for more Byron educators to have the same experience. If you have an idea, you would like to work thru – dont be afraid to ask. The journey to this award started with the ideas of our teachers! The response was overwhelming! Teachers responded with great ideas and I am soooo excited to see how they are cultivated over the next few months. I even met with one VERY eager middle school teacher who asked, “What can I do in my classroom that is EPIC?” Wow – I honestly had techy goosebumps! The energy this award has brought to our district is amazingly inspiring! I cant wait to see what happens next and how it will benefit our kids! The new Google Apps: be sure you are in-service ready! What I did not expect was the hand full of users with problems today. These users previously logged in with their SCHOOL email address – before our transition – to create an account on Google’s public side of apps (like Blogger, Youtube, Picasa, ect) . I assumed that the email that Google automatically generated and sent to users with conflicting accounts would have been addressed. (Google does NOT give you the accounts that have conflicts – that would have been REALLY nice to have upon transitioning) I assumed that if you were still able to actively use your school Gmail accounts, even logging on the public gmail.com, that you would be good to go! Well, you know were assumptions got me today! These users could not fully login to our Gapps Picasa app – and would continuously revert to a temporary account. After about my 3rd problem account…and many clicking scenarios…I finally got the process down. I really wish I would have made screenshots but, in a scramble, screenshots was the last thing on my mind. I did want to share the gist of what you have to do to quickly transition the accounts. 1. Transfer your data to your current school Google Apps account. This is the EASIEST of the 3 options. It essentially is 3 clicks and you are off and running. 2. Transfer your data to a current gmail.com account. This also wasnt too difficlut, but if you want to separate your personal info from your school info – you may wind up transitioning the information later anyways. 3. Create a new public Gmail.com account. This was painful (well painful because I was in a time crunch) because I did not realize the process you have to go through to authenticate your NEW gmail.com address. (they have to send you a text or call you to give you your authentication code) I really appreciate gmail’s efforts to get rid of spammers, but this unexpected change made the situation a little bit worse. I am fortunate all of the participants in my session were patient while working out these bugs. I also realize that if I knew then what I do now, that I would have done a better job at prepping my staff about what to do if they receive a “conflicting account” email from Google. Was it a huge issue today??? Not at all. But, I thought this experience was good enough to share with others – especially if you are planning any workshops utilizing the new applications.